Thomas Graham Brown C Eng MIEE, was born in Glasgow in 1933. He attended Allan Glen's School in Glasgow, which in those days was a notable 'feeder' for the science faculties of the local universities. After leaving school he joined the local branch of the engineering firm Kelvin and Hughes® Scientific Intruments Company as a "technical apprentice". All along Brown had a hobby interest in model-making, radios and the valve-based electronics for some years. Within Kelvin & Hughes he gained various experience in many different facets of electronic and instrumentation engineering. About 2 years into the apprenticeship Brown became involved in ultrasound used for non-destructive testing of materials, under Alex Rankin, who was a pioneer in the use of these techniques. He developed a system which would select for recording only echoes from particular regions of the test piece, by means of electronic time 'gating'. He also found a way of stabilising the overall sensitivity of the system by selecting a reference echo from the test piece boundary, and using it indirectly to control the overall sensitivity. This was a difficult task in those days. Brown went to the University under a company sponsorship and studied Applied Physics. However he did not finish his second year and went back to work at Kelvin and Hughes®. In 1956, having learned that Ian Donald had much difficulty with the metal flaw detector that he was using (which had been passed on from Professor Mayneord at the Royal Marsden Hospital who used it to investigate the brain), Brown called Donald personally and subsequently offered to lend him a brand new M4 metal-flaw detector together with photographic facilities from his company, through the generous foresight of his superior, Alex Rankin. Although Ian Donald had been pleased with the results from this machine, both he and Brown had felt the need of a 2-D B-mode apparatus (not unlike the technique of the military radar) on top of the uni-dimensional A-scan that he was getting. 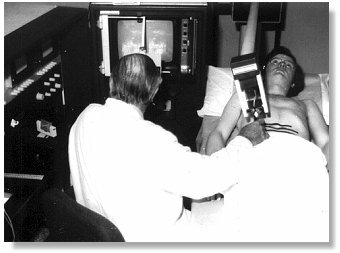 Together with Dr. John MacVicar, who joined the department as registrar in 1956, Bown and Donald came up with the world's first compound contact scanner where the transducer can be moved manually over the patient's abdomen with a resultant 2-D image reproduced on an oscilloscope. The transducer were mounted on a frame with linear potentiometers to measure its mean x- and y- positions and a sine/cosine resolving potentiometer to give a measure of the angle at which it was pointing into the patient. Patents were applied for by Kelvin & Hughes prior to the publication of their early results in the 'Lancet' in June 1958. Tom Brown was named as inventor, though commercial rights were assigned to the company. The design was updated and improved at the several versions that followed. The design was taken up for commercial production as the Diasonograph® by the Smith Industrials® of England which had bought Kelvin and Hughes®. By 1963, Brown took over as department head of the Medical Ultrasonics operations in Glasgow, after the death of former head Alex Rankin. In 1964 the Glasgow operation became the subject of an internal "take-over" by Smith's Aviation Division. Brown left to become Chief Engineer at Honeywell's Medical Equipment Division in Hemel Hempstead. There he became involved with equipment for open-heart surgery, coronary care and prefabricated operating theatres. In mid-1967, Smiths decided to close down the Glasgow factory, largely on account of the so-called "Firestone patents" on ultrasonic testing (see the Development of ultrasonic scanning techniques in Scotland 1956-1979), and sold the medical business to Nuclear Enterprises® in Edinburgh. 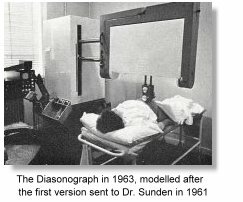 The NE 4102, later revamped and re-designed by Brown's successor Brian Fraser and Alan Cole, was an extremely successful machine and became the de facto standard in ultrasound scanners in Britain. (The following is an except from his article: "Development of ultrasonic scanning techniques in Scotland 1956-1979" written in 1994. Excerpted and reproduced here with permission).
" ...... One afternoon some of my friends who had been installing an experimental shadowless lamp in an operating theatre in the Western Infirmary mentioned that 'the doctor' there - Professor Donald - was using an ultrasonic flaw detector on people. Not knowing any better, I looked him up in the book, and telephoned him that evening at Western 5050. He sounded rather posh to this young native Glaswegian, but he was friendly and very courteous, but told me that he had all the technical help he needed from Ron Greer, of Dr. John Lenihan's 'Regional Medical Physics Department'. However I was welcome to come and see what he was doing. Ever the practical improviser, and realising that he had somehow to allow the amplifier to de-saturate after being clobbered by the transmitter pulse, Donald greased one end of the glass cylinder with Vaseline, stuck it on the patient's abdomen, filled it up to the brim with water, and placed the ultrasound probe in the end, directed through the water into the patient. The amplifier then had time to de-saturate while the sound pulse was travelling down the water column, and Donald was able to see echoes coming back from inside the abdomen when the sound pulse reached it...... . I went back and telephoned Alex Rankin, who was by then back in the Barkingside labs, embroiled in the automatic scanning fracas. Being the man he was, never allowing paperwork to get in the way of progress, it was only a few days before a brand new Mk IV Flaw Detector arrived at Glasgow Central Station, sans paperwork, marked "To be called for by Mr Tom Brown"........... . The MKIV was also a double-transducer machine, but when used with a decent double-transducer 'probe' the results were strikingly better than anything Donald had ever seen before ....... . The other thing I was able to do at that time was to dig up an old, but still functional 'Cossor' oscilloscope camera with which to record the traces on the screen on 35mm film. This seems to have been a much more significant addition to the system, at least so far as Donald was concerned, than I realised at the time, though on my part it was just another bit of scrounging, at which I was to become rather adept. From the A-scope experiments it appeared that there actually was a lot of echo "data" being returned from inside the patient. Whether this was all really going to lead to useful "information" was of course not known, but even with the A-scope we were already able to recognise fluid-filled cysts, and to discriminate reasonably confidently between these and solid masses, and between either and the 'normal' bowel echoes.......... .
To me the A-scope display, adequate as it was for industrial testing, did not seem to me to be well suited to the medical application.......... . The general impression I had was there was a lot or raw data present, but that although we could extract some of it as useful intelligence, particularly in a few easily recognised situations, there was far more there than we could readily interpret. In other words - and it is a theme I was to come back to time-and-time again in the rest of my career - there was a serious mismatch between the manner in which the data was being presented, and the perceptual faculties of the observer who had to utilise it........ . There were clearly lots of echoes coming from lots of places within the body and what we needed was some automatic means of making sense of them by 'plotting' where they came from. When the ideas had gelled sufficiently, I found it a bit difficult to fire either Donald or John MacVicar with my 'dream' ; or even make them understand it. I remember thinking that it would be much easier just to build the thing and show them. While this may seem ungenerous, but it is not really a criticism. Donald and MacVicar had, after all, only recently started into exploring the medical utility of quite an expensive, sophisticated and highly-developed electronic package which had just come, fortuitously, into their hands. They had by no means exhausted its possibilities, but here was a young impatient who wanted, without any tangible resources, to rush off and radically change everything. However, Donald did make an approach to the company via one of the London-based sales people, Ted Smith, who he had come to know through a mutual and compelling interest in yachting.......... . Within Kelvin & Hughes I did already have the advantage of something of a track record, partly from my work on industrial ultrasound and partly from certain other 'rabbits' which I had produced out of other technological hats. Without this I do not think I would ever have been taken seriously. .............. When I first approached the company to be allowed to do this project it was via Peter Turner and then Bill Slater. They sent me off to see Bill Halliday at Barkingside. Halliday was 'Chief Scientist' of Kelvin & Hughes, and responsible for all applied acoustics work within the company, a substantial part of which was covered by the Official Secrets Act....... . In due course a memo came out from Mr. Slater to the effect that a budget of all of five hundred pounds had been allocated to the project, and Mr. Brown was authorised to spend half a day per week working with Professor Donald. It was a case of scrounging for parts wherever I could, and generally I could count on goodwill - or at least patient tolerance - on my raiding expeditions. I managed somehow - and cannot now remember how - to get hold of another rather older MK IV flaw detector which was to provide the basic transmitter, receiver and high voltage power supply for the system. The display unit from the old Mark IIB was cannibalised to provide an extra screen, and I managed to reclaim the main electronic cabinet and power supplies of my experimental weld-testing system, which were by then lying discarded at the Barkingside R & D Department. An additional six-inch electrostatically-deflected cathode ray tube of the type used in the MKIV flaw detector was winkled out of the stores, and I had the bones of the electronic system, which I could then start to clothe with flesh. However the prototype was extremely crude, and the whole thing was built, using government-surplus bits, and "Mecanno" sprockets and chains, on a borrowed hospital bed table. Initially this allowed only transverse scans to be made, with the unfortunate operator - usually John MacVicar - guddling about underneath it in a most cramped and uncomfortable position, hardly conducive to good experimental technique.............. ."
For the technobuffs, the electronic system, though it was novel, had the virtue of great simplicity. 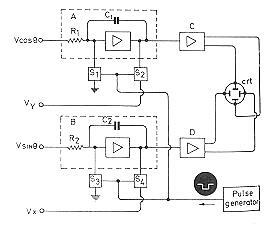 It consisted, in essence, of two vacuum-tube integrator and mixer circuits, acting as vertical and horizontal timebase generators. The vector sum of these timebases, as seen on the display, was a linear timebase vector, starting at a position on the screen corresponding to the position of the probe spindle, and moving in a direction corresponding to the direction of propagation of sound into the patient. When the timebase got to a position corresponding to the position of the probe face (with corrections because of the type of "Perspex" fronting blocks used), the transmitter was fired. As echoes came back they were amplified in the MKIV, and then passed to a rather unusual signal processor - where art and science tended to co-exist - and then used to brightness-modulate the timebase............... . The frequency used was 2.5 MHz, corresponding to an ultrasonic wavelength of 0.6mm This was chosen partly because it was one of the standard frequencies on the Kelvin & Hughes industrial machines, and partly because it was quickly found to give a good trade-off between range and resolution, with the available technology of the day. Patents were applied for by Kelvin & Hughes prior to publication of our early results in 'Lancet' in June 1958. I was named as inventor, though commercial rights were assigned to the company. I understand that this patent, and it's foreign cases, are regarded as being extremely basic, and cover all subsequent contact scanners. However, Kelvin & Hughes were locked in a patent battle with Automation Industries, and no attempt was made to enforce these patents until they were eventually acquired by Automation about 1965............... .
............ About 1958/1959 a young Swedish obstetrician, Bertil Sunden, visited Donald looking for a subject for his MD thesis. By that time the automatic scanner was well on the way, if not already working, but Sunden was quite insistent that he wanted us just to reproduce Donald's original equipment for his use, and that he was willing to pay whatever was needed to have this done. I designed a light-weight 'measuring frame', which was to be supported over the patient by an articulated arm and 'inverted-u-shaped' member, such that the measuring frame could be moved bodily in both longitudinal and transverse directions, and could be rotated both about a vertical and a horizontal pivot system. There was a chain operated parallel-motion device to control the orientation of the measuring frame, and keep it independent of the translational adjustments. The whole thing could rise and fall on a counterbalance system, contained within a substantial column. Dugald Cameron, later Head of the School of Design, Glasgow School of Art, co-operated in the design. He produced 'air-brush' drawings of the concept which were exceedingly useful for communicating what we wanted to others, and for soothing the customer as time passed, about why it was worth waiting for his machine!! However, at that time Cameron had barely finished his studies, and this was virtually his first real commission............. ."
Brown's early scanner design set an important standard for other designs that followed. The Denver group (Howry, wright and Meyers) fabricated a machine with a similar design after meeting up with Donald and Brown in London in 1959. A comparable design also came out of the Chinese investigators in Wuhan in the early 1960s. 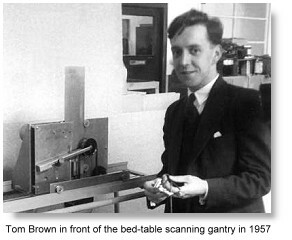 Brown also invented and patented an elaborate and expensive automated compound B-scanner in 1958 which took care of a number of scanning variables of the operator. It was at the machine's exhibition in London in 1960 that Ian Donald met for the first time Douglass Howry from the United States who had been using the much larger size water-tank circumferential scanner for several years. The automated scanner was however considered too expensive for full commercial production and had never become popular. 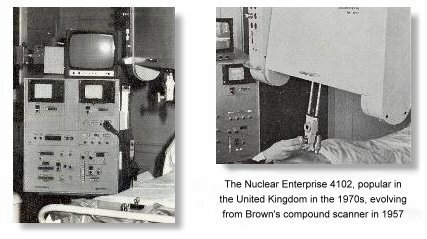 Brown left the company in 1965 and returned after a lapse of 2 years when Nuclear Enterprises® Ltd. acquired Kelvin and Huges®'s medical ultrasound business. 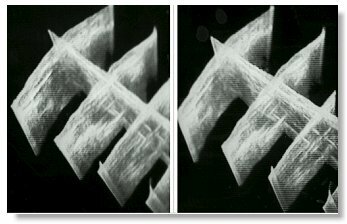 In 1970, Brown was research fellow at the University of Ediinburgh studying 3-dimensional imaging possibilities. He joined the Sonicaid® Ltd. in 1973 and led a team to develop an entirely new 3-dimensional stereoscopic contact compound scanner. The machine, which was called the Multiplanar Scanner was exhibited at the AIUM meeting in 1976, followed by commercial production in the following year. A discription of his 3-D multiplanar scanner is excerpted here. The Multiplanar scanner in use in 1976. The operator is viewing the stereoscopic image pair on the screen, via the prism stereoscope mounted in front of it. Note also the View Control Unit on the console desktop to his left. Demonstration composite image pair of transverse sections, intersected by a longitudinal scan. Stereoscopy is reversed to allow the images to be fused without having to use a stereoscope by the "cross-eyed" method, but only by those with that curious gift. Commercial sales were nevertheless scant and the production was discontinued in 1979. Although Brown's venture into the realm of 3-D ultrasonography was not met with success (at a time when computing technology was meager), his foresight was prudent and admirable. Brown did not find further employments in the medical instruments industry and moved to work in the offshore oil and gas business, where he remained until 1998. After his retirement, Brown worked part-time as Quality Manager for the Radiological Protection Centre at St George's Hospital at Tooting, London. 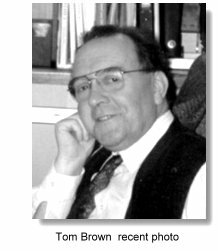 In 1984 Tom Brown was elected together with Professor Ian Donald the first 2 Honorary fellows of the British Medical Ultrasound Society. In 1988 he was presented the "History of Medical Ultrasound Pioneer Award" by the World Federation of Ultrasound in Medicine and Biology (WFUMB). In 1996 he received the Ian Donald Gold medal for Technical Merit from the International Society of Obstetrics and Gynecology (ISUOG). 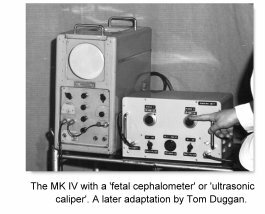 Read the full unpublished paper by Mr. Tom Brown on the Development of ultrasonic scanning techniques in Scotland 1956-1979. Images courtesy of Mr. Tom Brown and Mr Fleming.